You move your hands in a way that feels logical, familiar, and, after a little bit of practice, second nature. inVokeR is completely immersive, very satisfying, and the main reason why the title has been met with success in the world of virtual reality. There a few game modes in which to test your wizarding ability. There’s a single player mode which allows you to battle wizard A.I. in a few different difficulties, a target practice mode to help you perfect your aim, and a “Boss Trial” mode, in which you fight a big ol’ monster by yourself or with your friends. There’s also an online versus mode but, understandably, given that it’s an early copy, it was not available to play. However, it's easy to see that online multiplayer will either be as fun as or more fun than the single player modes I experienced. inVokeR works with a simple, effective formula: cast destructive energy balls with your right hand; cast protective, offensive, and modifying spells with your left. You have a store of mana, conveniently visible on your left wrist, and you dodge your opponents spells by moving out of the way. 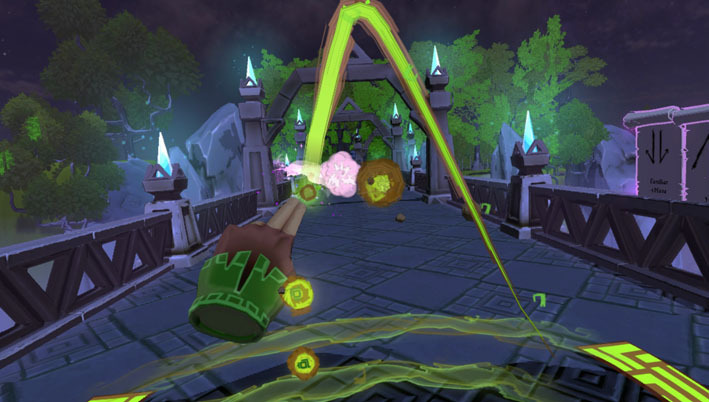 You can cast your energy balls straight-on or ricochet them off the wall; the objective is to confuse your opponent by constantly switching up your approach and attack such that you won’t be blocked, dodged, or predicted. There’s a fair amount to learn, so inVokeR’s tutorials seem a little daunting at first. You have four different elemental characters to master: Fire, Ice, Earth, and Wind, each with unique abilities, and a healthy bunch of spells to learn. But, because of how intuitive the spells are, they’re easily memorized with practice. For the protective shield, you draw an upside down triangle, which, looks like a shield. To ’split’ your energy ball into two (a tactic I spammed quite frequently), you make a ’safe’ motion (think umpire). To slow down an energy ball, you draw an L shape, which represents the hands on a clock. These are just a few examples and, if you’re forgetful during the match, you’ll find on the wall next to you a (permanent) cheat sheet. Once you master spellcasting, you can experiment with the different elements and their accompanying “special” move. Fire allows you to throw more than one energy ball at a time, Ice can be split into a barrage of energy balls, Earth allows you to throw a giant boulder, and Wind lets you throw your energy balls with increased speed. Each has their own pros and cons, but I found Fire to be indisputably the best, given my play style. [EN: This] I played my first duel against the A.I. at apprentice difficulty, and I lost quickly. This is because inVokeR’s timing and hitboxes are a little hard to master. Because your right hand has dual functionality, used not only to cast an energy ball, but also to modify it after the fact, it’s a bit tricky to know what ’mode’ your right hand is in; that is, if it’s ready to perform the function that you want it to perform. Hopefully, this finicky setting can be improved upon or explained better in future patches. 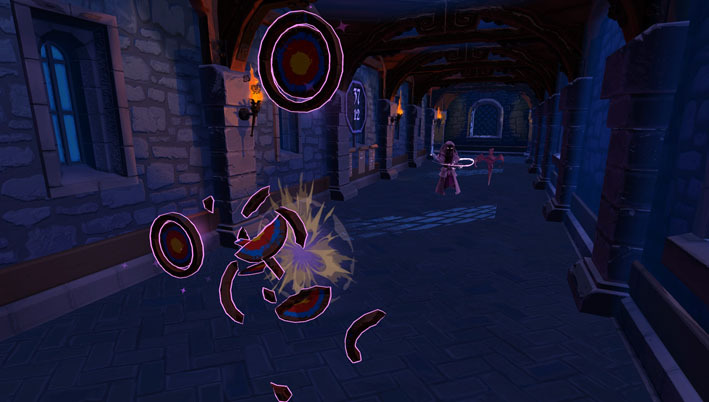 Because dueling relies on your ability to dodge spells, it’s hard to get used to a character’s hitbox. It’s easy to forget that the Vive is just tracking a headset and two controllers, so occasionally you’ll be hit even though you think you dodged – less a knock on inVokeR, and more just broad commentary on the current reality of VR. Once I overcame these two hurdles through practice and over-dodging a bit, I became a duel master. I could crush the A.I. on every difficulty, and it was satisfying. I played some of the target practice mode and my accuracy definitely increased. Before it, I was hurling my energy balls overhand instead of “pushing” them forward. I changed from a little less baseball-like to a little more Kamehameha-esque and I got even better. I tried the boss trial mode, but honestly, it seems like it’d only be fun in a group. By the time I’d played through all the features, I was really thirsting to take on some other people online and I’m excited to see what that mode will be like. inVokeR is pretty cartoonish, but that’s not to say it looks bad or juvenile. The menu area and three environments look great, though I’d love to see a few more, and the character models are oddly cute and well-designed. I didn’t have any texture problems or headset issues while playing: the game is perfectly stable in this regard. The sounds of the spells were okay, though I do wish they were a little more impactful or dynamic. There’s a lot of latitude with how far the developers could go with these powers and I wish they had taken advantage of their full potential. I couldn’t stand the voice of the little dragon giving the tutorial, but that might just be me. I did have some issues towards the beginning of my play-through with the left-hand tracking. Sometimes it would appear just left of where my hand would actually be and this issue didn’t seem apparent in my other VR games. It magically seemed to resolve itself, seemingly permanently midway through playing, so I guess I must have cast the right spell. Re-playability is the only major concern I have with inVokeR. While I wasn’t able to experience the multiplayer option, which could change my opinion, I found all the single player options to run a bit stale pretty quickly. If inVokeR’s player base manages to be plentiful, I could imagine returning much sooner. inVokeR is, by far, the best spell-casting virtual reality experience that I’ve played due to its immersive controls and exciting combat. If more modes and features get added past those initially available, inVokeR will have no problem becoming a must-have VR experience for those wishing to duel in the world of wizards.